The AVATAR kiosk as being developed by The University of Arizona, is an interactive screening technology which assists law enforcement at border crossings and airports to detect lies and other deceptive behaviours. When individuals approach the kiosk, they scan their identification, and it detects pupil changes down in the millimetre level and asks a few questions. Border control would step in to work directly with individuals whose behavior is suspicious as flagged by the AVATAR Kiosk. Summary: Apple patents biometric authentication via fingerprint behind touch screen, and / or a front-facing camera for retinal recognition, speaker (voice) recognition , or collecting DNA samples for recognition via genetic code. 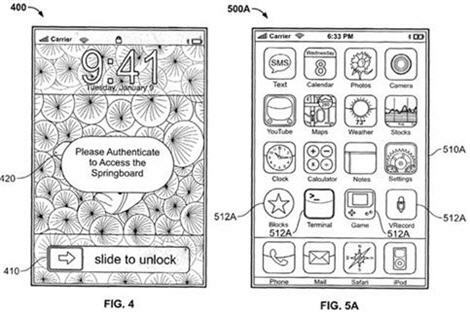 Apple has filed a patent for biometric authentication (checking after identification) including installation of a hidden sensor behind the screen that would recognize the user’s fingerprint when touched, and / or a front-facing camera for retinal recognition. The filing also suggests further possibilities, such as the device being capable of recognizing the user’s voice, or collecting DNA samples for recognition via genetic code.